Procon Technology has searched all over for these value-for-money DIN Rail Industrial PSUs (Power Supply Units), SMPS (Switched Mode Power Supplies) or Switch-Mode Rectifiers. Please see prices below and email us regarding your quantity requirements or special application. OEM, wholesale or re-seller discounts are available. Meanwell, also supply mains power adapters from 12W to 280W, Battery Chargers (including UPS), DC-DC Converters, DC-AC Inverters and LED Power Supplies! NEW! 15W to 150W STEPPED DIN RAIL POWER SUPPLIES NOW AVAILABLE! click here. A range of plates, brackets and clips are available from Meanwell to mount other power supplies - click here. For the Industrial caged power supplies in voltages 2.5V to 55V - click here. HDR range (above centre) - NEW! The HDR series provides 15W, 30W, 60W, 100W and 150W with voltages of 5V, 12V, 15V, 24V or 48V. Replaces DR-15, DR-30, DR-60, DR-100. Fits DIN standard surface covers, metering enclosures and switchboards! Features: narrower DIN rail width than DR units, better efficiency, higher temperature operation, 48V output available, constant current limiting at >50% output voltage, DIN rail (TS35/7.5 or 15) mounting, LED power OK indicator and UL508 (industrial control equipment) approval. Now with Over Voltage Category (OVC) III rating. 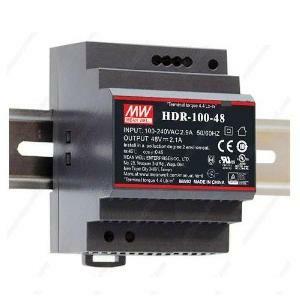 The HDR-150 is the first Meanwell DIN rail power supply to provide with more than 120W for 12V and 15V outputs! MDR range (above left) - also available for UPS and LED applications! The MDR series provides 10 to 100 Watts of output with voltages of 5V, 12V, 15V, 24V or 48V (with adjustment up to +25%)*. It has most of the features of the DR series in a more space saving design (industrial standard housing) and provides a DC OK LED and DC OK signal output (capable of driving a remote lamp, PLC input or relay). Other features include; extended temperature range -20°C to 70°C, an input voltage range of 85-264VAC or 120-370VDC and a hold-up time of 50ms (240VAC) at full load to provide a buffer against momentary power loss! A 3 year warranty is provided. They are also EN61000-6-2 heavy industry level approved. The MDR-100 has the added advantage of built-in PFC (Power Factor Correction), OTP (Over Temperature Protection) and high efficiency using ZCS/ZVS technology. The entire MDR range is UL508 (industrial control equipment) listed and has low no-load power consumption (less than 1W). This unique characteristic can significantly expand the application of MDR range beyond heavy industrial fields to data communication (datacom) and IT applications that require "green" power to save energy under no-load or low-load conditions. *Note, the MDR-10 does not provide voltage adjustment. The 40-100W can be adjusted up by 25%. i.e. 5V to 6V, 12V to 15V, 24V to 30V. The EDR and NDR ranges has been designed as a smaller, lower cost, replacement for the DR series providing 75 and 120 Watts of output with voltages of 12V, 24V or 48V. A 150W model, EDR-150 is available in 24 Volts only! And 240W and 480W are now available in the NDR series. Like the DR range, the EDR and NDR ranges offers constant-current overload protection with automatic recovery (except 480W). Both series offer operation at lower temperatures... down to -20°C. The NDR offers higher temperature operation (from 60°C to 70°C) and longer warranty than the EDR series as well as more extensive categories of use with better EMC standards. In general, the EDR range is designed for price-sensitive industrial applications. The SDR range provides 75W to 960W of continuous output (150% peak for 3 seconds*) with voltages of 12V (SDR-75 and SDR-120 only), 24V or 48V. This is a cost-effective alternative to the Siemens SITOP PSU300M or PULS Q-Series power supplies! The SDR range features 150% peak current for 3 seconds (minimum) to allow trouble-free energizing of loads with high starting currents such as motors, lamps (incandescent & LED), inverters and DC-DC converters. Other features include; 94% efficiency typical (50% less heat generated compared to others), extended temperature operation (70°C), a DC OK relay output (can be used, together with external diodes, in a redundant system to indicate when a power supply has failed) , active Power Factor Correction (PFC), 100-240VAC operation and compact size. The SDR range is the first Meanwell Power Supplies with GL marine and SEMI F47 (voltage sag immunity) compliance. In addition, the WDR range operates on 240VAC to 415VAC (300-700VDC) and has automatic recovery after over-load! Now available is the SDR480P with parallel capability - up to 8 units. Also available is the TDR-480 (three phase), the SDR-960 (single phase) and the TDR-960 (three phase)... just 110mm wide and allows parallel capability up to 4 units. *130% peak current for SDR-960. Note specs provided are the minimum current available and power supplies may provide up to 200% current output for up to 10 seconds... 3 seconds is the absolute minimum! Further note that a short-circuit does not normally cause the SDR power supply to shut down because insufficent output power is achieved with a short-circuit! The SDR range is now the number one choice for road-side infrastructure in Australia, including: number plate recognition, traffic management, automatic warning systems and electronic signage and road traffic cameras! DR range (not shown) - NOT RECOMMENDED FOR NEW DESIGNS! The DR series provides 15 to 960 Watts of output with voltages of 5V, 12V, 15V, 24V or 48V. Features: constant current limiting, DIN rail (TS35/7.5 or 15) mounting, LED power OK indicator and UL508 (industrial control equipment) approval. Some models are available in 415VAC (up to 550VAC or 780VDC) input, 2 or 3 phase in 24V or 48V output. A 960W model DRT-960 (in 24V@40A or 48V@20A) is also available. Please contact Procon Technology for pricing! HDR-15-v, 15W DIN SMPS v = 5V, 12V, 15V, 24V, 48V......... pdf $30.00 $33.00 . MDR-20-v, 20W DIN SMPS v = 5V, 12V, 15V, 24V $35.00 $38.50 . HDR-30-v, 30W DIN SMPS v = 5V, 12V, 15V, 24V, 48V......... pdf $40.00 $44.00 . MDR-40-v, 40W DIN SMPS v = 5V^, 12V^, 24V^, 48V^ $45.00 $49.50 . HDR-60-v, 60W DIN SMPS v = 5V, 12V, 15V, 24V, 48V......... pdf $50.00 $55.00 . MDR-60-v, 60W DIN SMPS v = 5V^, 12V^, 24V^, 48V^ $50.00 $55.00 . EDR-75-v, 75W DIN SMPS v = 12V, 24V, 48V - class A............ pdf $60.00 $66.00 news! NDR-75-v, 75W DIN SMPS v = 12V, 24V, 48V - class B $63.00 $69.30 . SDR-75-v, 75W DIN SMPS v = 12V, 24V, 48V (112W peak).... pdf $90.00 $99.00 . MDR-100-v, 100W DIN SMPS v = 12V^, 24V^, 48V^.............. pdf $80.00 $88.00 . DR-120-v, 120W DIN SMPS v = 12V, 24V, 48V $100.00 $110.00 . EDR-120-v, 120W DIN SMPS v = 12V, 24V, 48V - class A $70.00 $77.00 news! NDR-120-v, 120W DIN SMPS v = 12V, 24V, 48V - class B $72.00 $79.20 news! SDR-120-v, 120W DIN SMPS v = 12V, 24V, 48V (180W peak) $120.00 $132.00 . EDR-150-24, 150W DIN SMPS v = 24V@6.5A - class A $80.00 $88.00 news! HDR-150-v, 150W DIN SMPS v = 12V, 15V, 24V, 48V.......... pdf $90.00 $99.00 new! NDR-240-v, 240W DIN SMPS v = 24V, 48V........................... pdf $120.00 $132.00 news! SDR-240-v, 240W DIN SMPS v = 24V, 48V (360W peak) $200.00 $220.00 . TDR-240-v, 240W DIN SMPS v = 24V, 48V... 2 or 3 phase operation $180.00 $198.00 new! WDR-240-v, 240W DIN SMPS v = 24V, 48V (240-415VAC)... pdf $250.00 $275.00 . NDR-480-v, 480W DIN SMPS v = 24V, 48V........................... pdf $220.00 $242.00 news! SDR-480-v, 480W (720W peak) v = 24V, 48V........................... pdf $320.00 $352.00 . SDR-480P-v, 480W (720W peak) v = 24V, 48V /parallel up to 3840W $340.00 $374.00 . TDR-480-v, 480W DIN SMPS v = 24V, 48V /2 or 3 phase operation $270.00 $297.00 . WDR-480-v, 480W DIN SMPS v = 24V, 48V (240-415VAC)... pdf $360.00 $396.00 . SDR-960-v, 960W (1250W peak) v = 24V, 48V /parallel up to 4 $500.00 $550.00 news! TDR-960-v, 960W DIN SMPS v = 24V, 48V /3 phase /parallel up to 4 $500.00 $550.00 news! DDR-15n-v, 15W DIN DC-DC v = 3.3V,5V,12V,15V,24V... n = G, L $45.00 $49.50 . ......................Railway type 120+240W, DC OK, parallel up to 960W $180.00 $198.00 new! DR-RDN20, Redundancy Module 24V-27.6V 20A + failure alarms $60.00 $66.00 . DR-UPS40, UPS Module for 24V-27.6V 40A systems + failure alarms $90.00 $99.00 . DRC-40n, 40W DIN SMPS A = 13.8V, B = 27.6V /charger + UPS $60.00 $66.00 news! DRC-60n, 60W DIN SMPS A = 13.8V, B = 27.6V /charger + UPS $70.00 $77.00 news! DRC-100n, 100W DIN SMPS A = 13.8V, B = 27.6V /charger + UPS $90.00 $99.00 news! DRP-03, DIN Rail (TS35/7.5 or 15mm) Clip - 45mm wide $3.00 $3.30 . DRP-04, DIN Rail (TS35/7.5 or 15mm) Clip - 80mm wide... special $3.60 $3.96 . All MeanWell power supplies we sell have international approvals (UL, CB, CE, TUV, EMC) and Australian C-tick approval and have built-in short-circuit, overload and OVP (Over Voltage Protection). To determine the output current divide the wattage by the voltage. e.g. 240 Watts at 24V provides 10A. Note the maximum current is derated at temperature extremes (see data sheets). All models 240W and above (plus MDR-100 & SDR-120) have active PFC (Power Factor Correction). SDR models have GL marine and SEMI F47 approvals or compliance. All test reports, certificates and declarations are available as PDF documents... please request a copy by email. 1. @With short-circuit and overload protection, some supplies shut-down and must have the power cycled off and on again to recover, some have a hicup mode and recover automatically and others have constant current limiting. Note, when driving motors, incandescent lights and highly capacitive loads the supply must allow for the peak current or a constant current limited output is recommended (e.g. DR, EDR, MDR, NDR, WDR* versions). *some units only. Please check what mode of operation you require before purchase! 2. All MW DIN Rail power supplies have exposed supply input terminals and therefore they must be used inside a control cubicle or suitable enclosure for OEM (Own Equipment Manufacturer) use. For mains adapters and desktop power supplies from Manson and Meanwell - click here. 3. 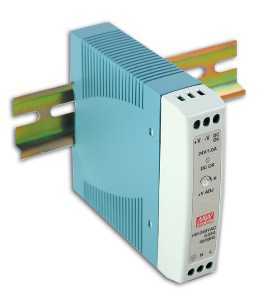 All MW DIN Rail power supplies operate from -20°C (new units from -30°C) to 60°C (most new units to 70°C). The current output must be derated at temperature extremes and with low input voltage. 4. 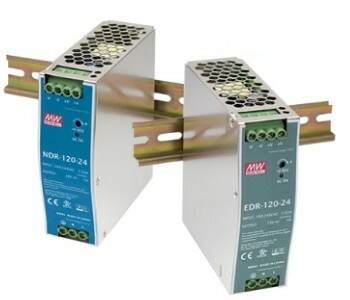 All MW power supplies have floating outputs and can be used as positive or negative earthed supplies and can be connected in series for increased voltage. Note, diode protection against reverse voltage may be necessary and, remember, any voltage above 60VDC is hazardous - the requirement of SELV (Safety Extra Low Voltage) of IEC60950-1. Please ask for an information sheet for this and other applications (e.g. using them in parallel or as a battery charger). 5. The MDR and SDR range may be used to replace Siemens 6EP1332, 6EP1333, 6EP1334 models, Omron S8VE, S8VS, S8VT and S8PS models and Delta CliQ series. 6. For installation notes click the following part number (also see the user manual and the individual data sheet)... DR15-100, DR45-DRP480, DRH-DRT, EDR, HDR, MDR, NDR, SDR, TDR, WDR. Procon Technology is happy to provide any in-stock power supply to government, semi-government or large Australian company 'on-approval' for evaluation and testing over 30 days. Remember OEM, wholesale or re-seller and quantity discounts are available. It doesn't matter whether you are using; ABB, Aros, Absopulse, Agilent (HP or Hewlett-Packard), Allen-Bradley, Altech Corp, Amtex, Astec, Astrodyne, B+B, Bel, Block, Cabac, Cabur, Calex, Cosel, CUI Inc, Delta, EA (Elektro-Automatik), Emerson, Excelsys, HiTek, IDEC, IMO, Lascar, Mitsubishi, Multicorp, MuRata, Omron, Phoenix Contact, Powerbox, Power-one, Powertech, Puls, Recom, Rhino, RS Components, Siemens, Snaptec, Sola HD, Statronics, SunPower, TDK-Lambda, Telemecanique, Traco Power, Weidmuller Ecoline or XP industrial power supplies, I'm sure we can find something on the Mean Well range to replace it at a more cost-effective price without compromising quality or reliability! Telephone us on 03 98306288 or email us with your requirements. NOTE some of these brands only provide a 1 year warranty. Meanwell provides 2 years on the EDR ranege, 3 years on most units, 5 years for RSP (750W and above), RST, HRP/G and MSP, 6 years for HEP series and HLG series 7 years!!! Drop-in equivalent part numbers to Meanwell DIN Range: MDR20 = 428-449, 428-427, 428-433, 428-451. DR30 = SD-30. MDR40 = 428-439, 428-423, 428-455, 428-451. DR45 = SD-45, MP3190, MP3192, MP3194, 282-524, 282-473. DR60 = SD-60. MDR60 = DRS-6000, M8405, M8409, M8413, 428-461, 428-467, 428-477, 428-473. DR75 = SD-75, 282-495. MDR100 = 428-483, 428-445, 428-411. DR120 = DR-SPS120W24V, SD-120, M8406, M8410, M8414, MP3195, MP3196, MP3197, 282-518, 282-502. DRP240 = SD-240, 282-568, 282-580. Contact Procon Technology for other equivalents! Disclaimer: The above specifications are subject to change without notice. Please ensure the suitability of these products for your application before purchase. In applications where mains surges may occur (e.g. due to lighting strike) additional protective devices should be fitted... such as the Meanwell SPD-20-240P. Further note that the power supplies with open terminals are intended to be installed inside a "suitable" protective encloser with adequate ventilation provided. They must be installed by a qualified person according to local electrical authority regulations. Please contact us should you have any doubt. Some FAKE Meanwell power supplies* have also been sold by overseas suppliers - BEWARE! Always purchase from an authorised Australian Supplier! That way you'll be able to make a warranty claim if necessary and you'll also be assured that the power supply meets Australian Standards or has the necessary Electrical Safety Approvals AND works properly without interference! Click here to see one cheap "fake" or "look a like". Notice the look-a-like logo "M&W" another is "MiWi" and "WH" (Wei Hao).